Light: Seeing growth opportunities in unpleasant events. Experiencing a dramatic change in personal perspective. Making the best of an unforeseen change in your life or work. Suspending disbelief. Making sacrifices. Shadow: Being untrue to yourself and your values. Refusing to make sacrifices when appropriate. Refusing to adapt to new situations. Blaming others. Profiting at the expense of others. Mythical/Spiritual: The Crucified Christ. Isaac as a sacrifice. Prometheus bound. Jonah and the whale. Lazarus. Any hanged or sacrificed god. Judas. Story: One of the main character’s allies is discovered to be working secretly for the antagonist. Relationships. What doesn’t move forward isn’t growing. If you’re hanging by a thread, it might be time to grab the scissors. If you can learn from what’s not working, do so, but don’t equate learning with having to stay. Work. Occasionally, no amount of effort will move a project to completion; progress simply isn’t the cards, despite your best efforts. Learn from setbacks; turn disappointment into opportunity. Spirituality. Sometimes the best action is no action at all. Suspend your need to have a hand in things. Consider, too, the value of small sacrifices. What you give away will come back to you greatly multiplied. Personal Growth. One sign of maturity is your ability to deal effectively with the unexpected. Rather than be decimated, look for the lesson. If you’re true to your own values, no disaster will get the best of you. Fortune Telling. A traitor is revealed. One of your friends is working against you. Change your ways or suffer the consequences. When? When you least expect it. The inverted traitor. Renaissance audiences would immediately recognize a hanged man as a traitor because hanging traitors by one foot was a common practice. Are you bound to any old habits that, in this situation, betray you? The serpent. 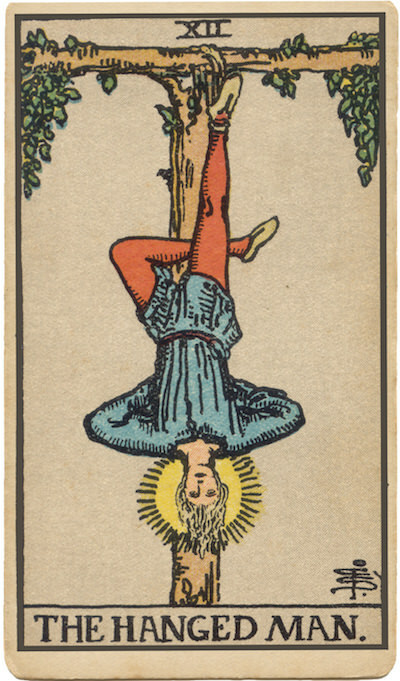 One occultist taught that the image of the Hanged Man was “originally” drawn right-side up, as a man stepping over a snake (thought to be a representation of the missing virtue of Prudence). What would be your most prudent course of action now? The halo of enlightenment. The Marseilles Hanged Man is clearly being punished. As they mapped concepts of sacrificial enlightenment to this card, occultists added the halo. What have your own trials taught you? How might those lessons apply now? How can I radically alter my perspective? How might being stuck actually be a blessing in disguise? How can I help myself see the glass as half full?